The molecules have specific absorption lines that depend on the specific molecular energy level transitions of the species. For gases, these lines are also particularly known (sub-picometer), narrow and insensitive to environmental conditions. A gas cell is simply a tube filled with a gas or a gaseous mixture of known chemical and isotopic purity and pressure and can be used as such or coupled to fiber optic cables. 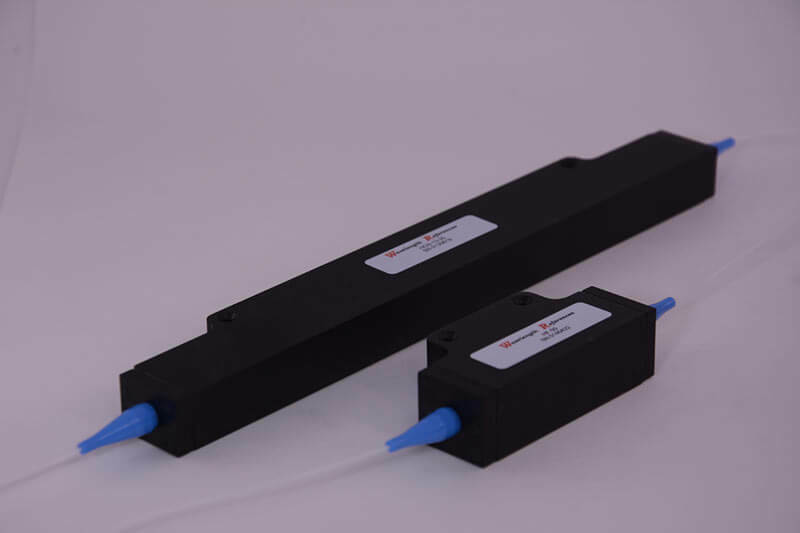 In addition to standard gas cells equivalent to those proposed by NIST, Wavelength References offers a variety of gas cells that greatly expand their application. If you have a custom application, do not hesitate to contact us, we accept custom orders. Methane, ammonia, hydrogen fluoride, hydrogen chloride, carbon dioxide, water vapor, hydrogen sulphide, nitrogen, argon, nitrogen dioxide and acetylene, hydrogen cyanide and carbon monoxide. The cells can be filled at any pressure lower than the atmosphere and can be filled with pure gases or mixtures. We can propose fiber-coupled gas cells having several path lengths that are optimized for the absorption resistance of the gas present. Path lengths from 3 cm to 80 cm are available. Dual gaz C+L gas cells. Tri-gaz C+L band gas cells. Four gaz S+C+L band gas cells. HF 1300nm band gas cells.